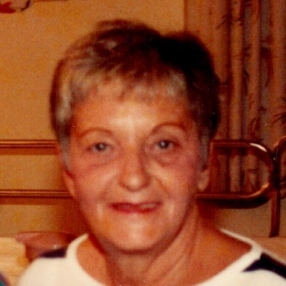 On March 24, 2019, Constance Rita (Doucette) Daigle, 89, of Bristol, was reunited in Heaven with her beloved cribbage partner and king of her heart, John, who left the card table in 2013. They were married 61 years. Connie was born in Madawaska, ME on June 16, 1929 to the late Vital and Jeannette (Chasse) Doucette and moved to Bristol at age 14. She was a graduate of St. Ann’s School and Hartford Trade School for Hairdressing. She worked as a hairdresser then at Stanley Tools, Superior Electric, Garlock, and Criticon. Connie and John retired in 1989 and spent 15 wonderful years traveling in their motorhome managing to visit every state in the USA except Alaska (they flew to Hawaii for their 25th wedding anniversary). Card games were a big part of their lives with family and friends; cribbage, setback, spades, poker, and charlemagne were familiar pastimes at “Club 77”. The cards were stacked in her favor. The last two years of Connie’s life were spent at Shady Oaks Assisted Living where she was welcomed, respected, and loved by a fantastic team of caregivers who became her family. We would like to express our sincere gratitude to Tyson Belanger and all his staff for the vitally important role they played in mom’s life and the love, dignity, and respect shown to her. She was predeceased by her parents, her sisters: Mildred Lauzon, Jeannine Albert, Joan Lubelczyk, Geraldine Lyman, and brother, Wilfred Doucette, and is survived by two brothers, Claude and Reginald Doucette, her four children and their spouses: Stephen and Judy Daigle of LaMesa, CA, Diane and Raymond Frankowski of Bristol, Allen and Kim Daigle of Myrtle Beach, SC, and Denise and Philip Coco of Bristol; grandchildren: Brian and Kaitlen Daigle, Amber and Coral Frankowski, Kelly LeBlanc, Kerry Young, Dante and Mason Coco; her great-grandchildren: Deklan Zukowski, Danika and Dakota LeBlanc; and many nieces and nephews.